It’s sometimes said that if you collected any half a dozen Vertues together that no two of them would be the same. Well, thanks to some of the many kind people who have been sending in photos and stories to the website while we’ve been on our travels, here’s half a dozen collected Vertues to prove it. 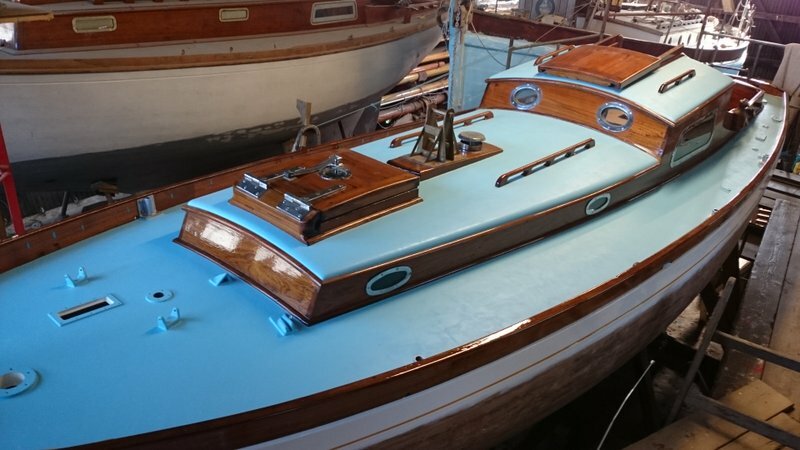 Adrian Morgan, boatbuilder, philosopher, historian and muse par excellence, recently sent some new photos of his lovely Sally, ‘vertue’ number 2, and I have to start with this one. Here is the epitome of that joyful sense of harmony with the elements that her helmsman must feel, as she slips effortlessly along across the calm blue sea, past the wild, unspoilt shoreline that is so typical of north west Scotland where she lives. You can appreciate the working boat genes in her ancestry when you see her utterly workmanlike simplicity and fitness for purpose. Look at that stays’l with it’s low aspect and overlap, pulling her along. 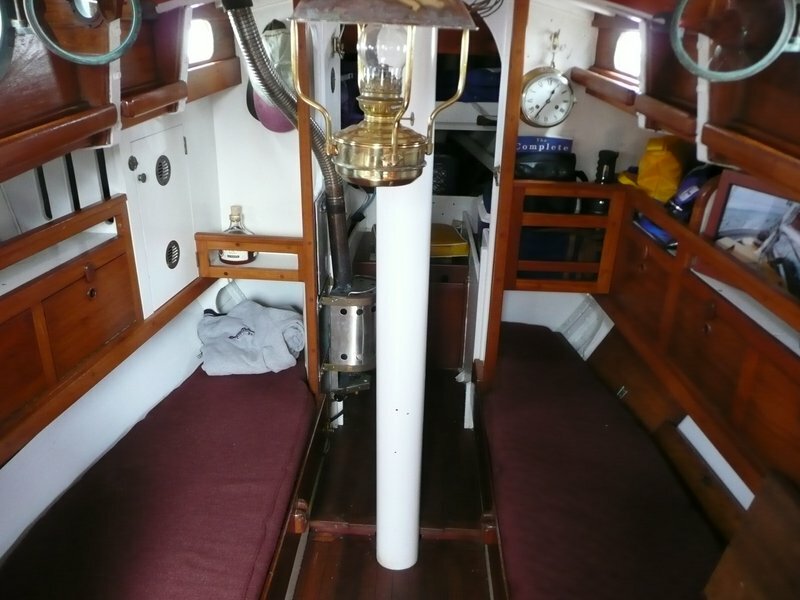 No fancy ‘guard rails’ and stanchions to be seen, and the clean, clear decks only encumbered by her anchor and a ‘proper’, hand cranking, windlass. To my eye it’s that lack of fussiness and unnecessary complexity that makes these early boats so attractive. There’s no need to add anything: they look just ‘right’. 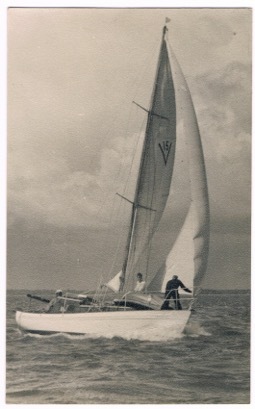 Marguerite sailing in the 1950’s. Only ten years, and a world war, after Sally was built, the ‘Vertue’ design had gained a name, a doghouse and an extra plank in its topsides. Jack Laurent Giles had returned from America and restarted his yacht design company, putting into practice some of the engineering experience he had learnt during the war. 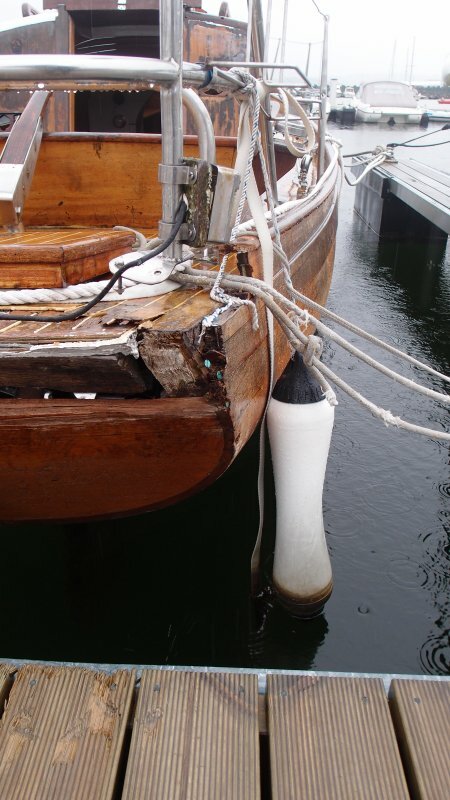 Some of his ocean racing yachts were using cutting edge technology and the revolutionary design feature of stepping the mast on deck was soon to transform the internal spaciousness of the Vertues. Marguerite is cracking on here although her crew look as if they are about to hand the big masthead genoa jib. The 7’ clinker pram dinghy, standard issue provided by her builders Elkins, doesn’t leave them as much foredeck room as they would have liked! I would like to thank Nina Jackson, her first owner’s daughter for sending me this stirring picture. We think that the Marguerite (or Marguerite of Poole) is still to be found on the west coast of Canada, in the Vancouver area, but would really like to know if she’s afloat again or not. Now that a number of Vertues are reaching their sixties and seventies it is inevitable that some of them will need some serious tlc. 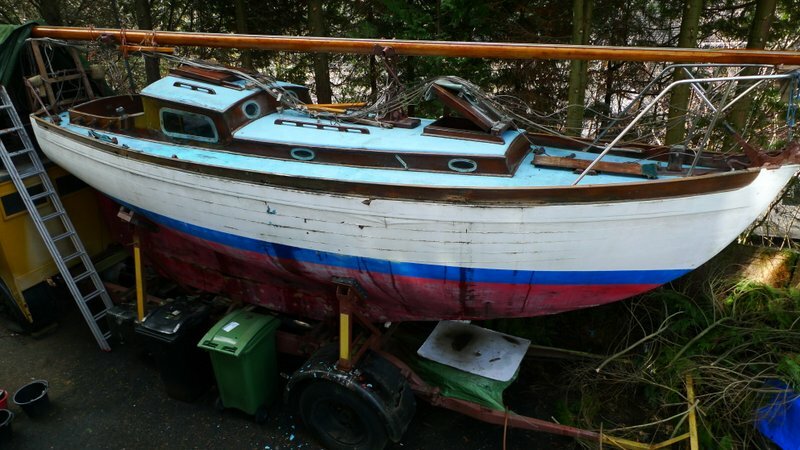 Alan Williams got in touch a while ago to say that he had found the Merganser V 47, and intended to restore her. I saw this picture he sent and didn’t expect to hear from him for a couple of years at least……. Merganser: what a transformation in only a few months, but hundreds of hours of work! 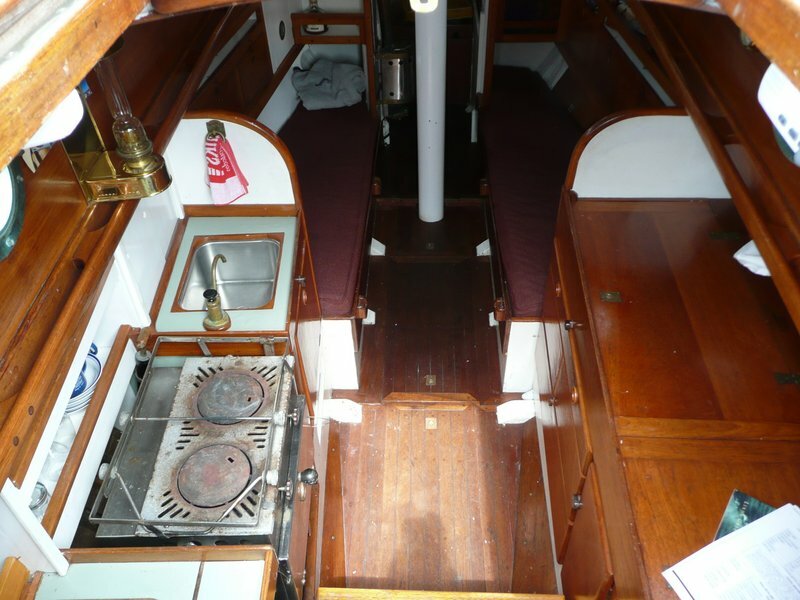 “Merganser is all caulked and seams puttied up, and I have been away for a fortnight so now I can start painting. Caulking and puttying took me 70 hrs over 7 days not bad for someone the wrong side of 60 (I have to admit it did me in!). 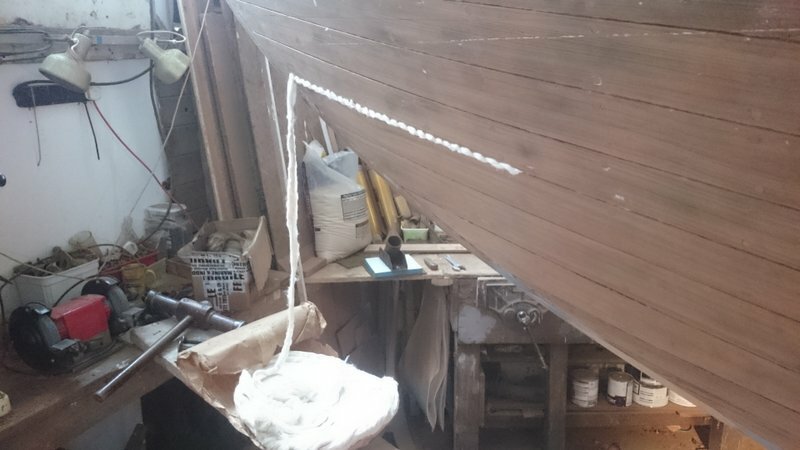 The caulking cotton has a wonderful story as far as I know it. Whilst working out in Australia in 1982 there was a riveted iron schooner which had driven up on to the Great Barrier Reef high and dry and the authorities wanted it gone, so I found myself helping emptying her and cutting her up into 8 or 10 ft square chunks for the scrap, among the stuff was 6 bales of caulking cotton, each individually wrapped in brown paper and labelled Undine International Company, Div. of Standard Mill Supply Co. Providence, R.I. U.S.A. Well I have had this stuff under my bench for 35 years waiting for a job good enough to warrant using it on, well I’ve used it, it was such a pleasure to use, far superior to the stuff available here in the UK far friendlier to the planking. I have attached a photo of the cotton, there is also a photo of the bumpkin and my overall measurement is just an inch short of 27ft. I returned her to this configuration as having postulated for 40 years and more the importance returning boats to their original design/concept, it would be two faced of me to do otherwise. I found a second hand Yanmar 1GM 10 and have known its previous owner and the engineer from French’s who originally installed it for the duration that it was in the boat so I’m hoping it’s a good one, so this is yet to be installed. I might be in the water for the end of June!!! 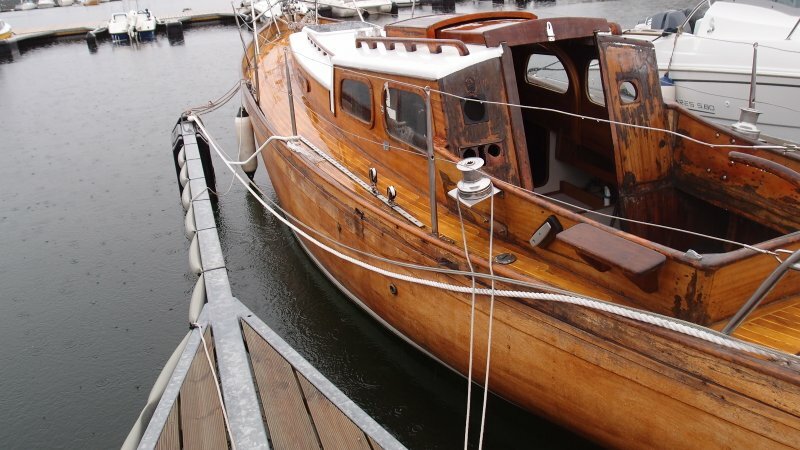 Twins: a composite Vertue for sale in the Netherlands. Is this the best of both worlds? 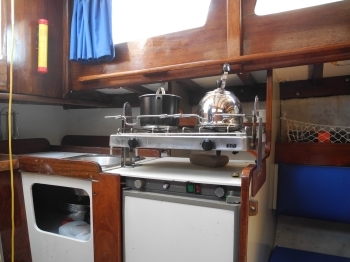 Twins V 181 was built in 1975 and has a grp/foam sandwich hull with wooden deck and superstructure. These photographs demonstrate how closely her appearance gives the impression of being built entirely of wood. 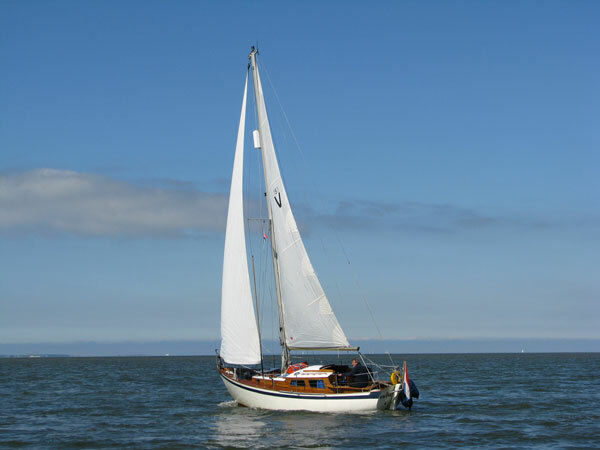 Her owner, Johannes Rijpkema, has just put her on the market, online, in Holland. We showed another composite boat, Andrio, but with an ‘ocean’ coachroof layout in our October Newsletter last year. Lotus before she was restored. Lotus in Norway as found……what a sad sight! Lotus V 55 looking very workmanlike. 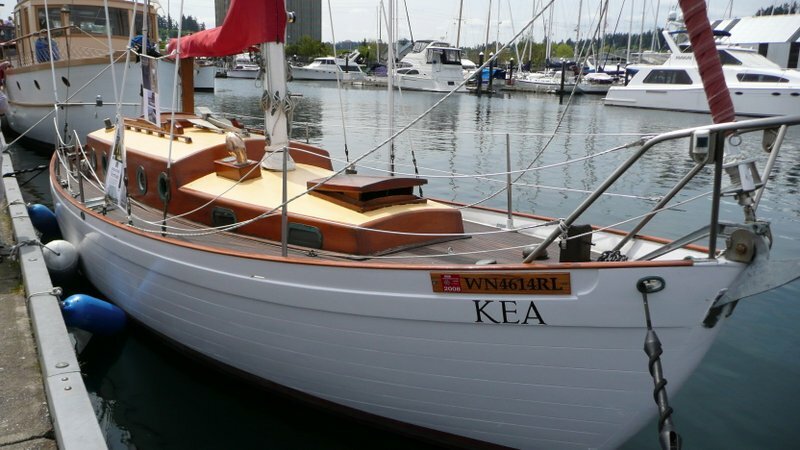 Meanwhile in that other ‘fjordland’ of the Pacific Northwest coast, John Aultman sent some photos of his gorgeous ‘Kea’, the heroine of Sam McKinney’s book called ‘Sailing with Vancouver’. Subtitled ‘a modern seadog, antique charts and voyage through time’ the book modestly describes Sam’s cruise north and west of Seattle and Vancouver, ‘inside’ the sheltering bulwark of Vancouver Island. Kea is one of those select few ‘ocean cruising’ Vertues who clearly share some of their design details with the Hiscock’s famous Wanderer III, launched in 1952. For it is no coincidence that in that same year both Icebird and Speedwell of Hong Kong were also launched, as slightly miniature versions of the same design. Humphrey Barton had actually included details of the design in the concluding chapter of his book describing the gruelling transatlantic passage of Vertue XXXV two years earlier. 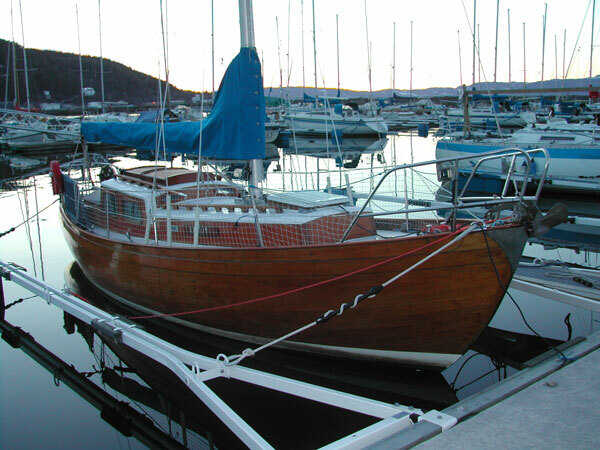 The low, stepped coachroof, extending forward of the mast, was a modification of the earlier Kalliste design that was radically changing the spaciousness of these post-war boats, and with greater freeboard started the trend towards the kind of space now found in the cruising boats of today. 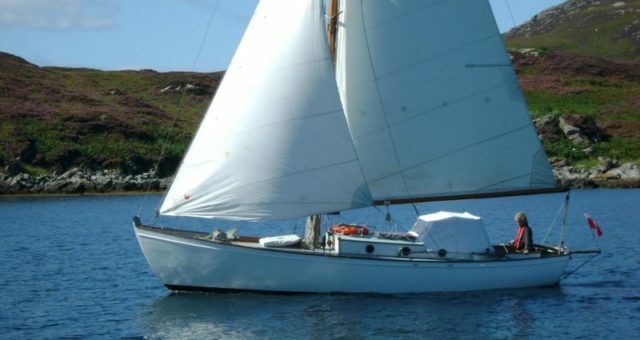 Whilst Speedwell cruises on under junk rig and the steady hand of Shirley Carter (see her blog speedwelladventures.com for latest news) her close sister ship Icebird is still for sale in Scotland. Please keep the emails coming in about your own boat and we will get back to producing some more frequent ‘Newsletters’ over the summer, with news and views about the fabulous Vertues.